Maturing nicely as a hardened 7yo, the very smart Uhlan du Val is in fine shape just at the right time as he gears up for a second crack at the Prix d’Amérique-Opodo. He began his career early on in one of the first races in Paris for 2yos at Enghien in August 2010, then went on to score the following spring in western France at Pontchâteau, not far from Nantes. 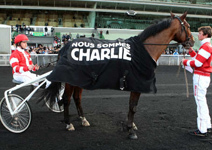 On a moving day where Je Suis Charlie banners could be seen both on and around the track, Uhlan du Val and Vulcain de Vandel came out on top in the final two Prix d’Amérique preps of the Vincennes Winter Festival. Even if Uhlan du Val was already ensured of a place in the Big Event on January 25, he nonetheless raced as if he meant it in Sunday’s Prix de Belgique. Cedric Mégissier’s smart 7yo took over at the half-way marker and strongly thwarted Vabellino’s challenge coming off the final bend to win in fine style. VIDEO: Bourgogne debrief and Sunday’s big race previews just a click away! The team at Equidia International continue their review of the Vincennes Winter Festival with a look back at Solvato’s resounding win in the Prix de Bourgogne which qualifies him for the Prix d’Amérique. 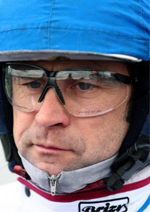 His driver Orjan Kihlstrom gives us his feedback in a race where Ready Cash bade farewell.